The Maine Department of Environmental Protection has specific rules and regulations that must be adhered to when considering building a pond on any public or private property. Municipalities also might have laws within their boundaries concerning the building of a pond. Maine waterways are protected under the Maine DEP. It is vital to check with state and local agencies before beginning a pond-building project. A farm pond is used for watering crops, animals or fire fighting. The state of Maine DEP regulates projects that will impact the natural environment, especially those that cover over 3 acres of land. 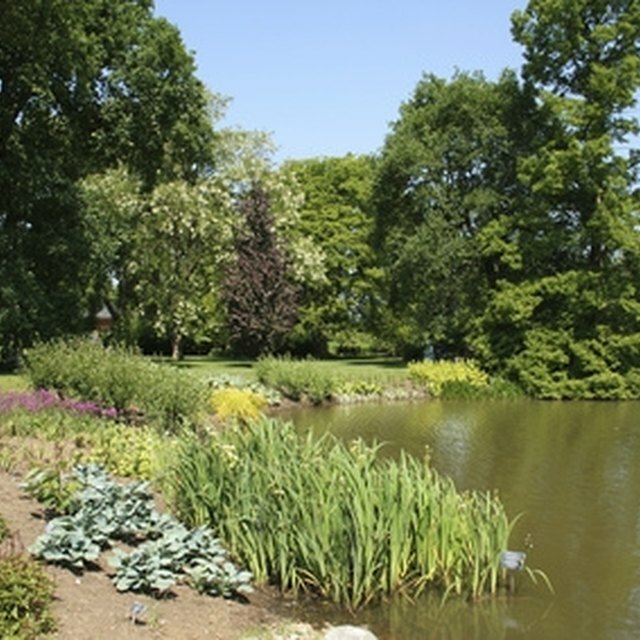 Pond projects that are most likely to be approved are spring-fed, the pond that is dug out, or sometimes, fed from a brook. According to the University of Maine Extension bulletin #2376 the pond that feeds back into the brook is the most desirable project. The following projects require a NRPA permit under the Maine Natural Resources Protection Act: Any project that requires displacement of soil, vegetation or sand by excavation, dredging or bulldozing; a pond that is planned to be built within 100 feet of any protected natural resource waterway such as a stream, lake, coastal wetland, flood plain, wildlife habitat or river; the altering, construction, repair or dismantling of any permanent structure such as a causeway or dock; and any pond-building project that requires the use of filling in an existing wetland, draining or dewatering an area. Any pond that will utilize less than 10 acres of impact area for the purpose of fire protection, cranberry production water storage or field crop irrigation is exempt under the Maine Site Law. It is best to consult authorities at the state and local level to be sure that the pond project comes under this exemption. Any pond area that will be under 10 acres and is used for other purposes might have to be approved by the Maine DEP. Any pond that is planned to have a water surface that extends beyond 10 acres must be approved in the planning stages. The Maine DEP has a shortened process to determine the pond projects that will not damage the environment. A copy of Chapter 305 Permit By Rule standards can be requested from the DEP to read and determine if time and money can be saved by going through this shorter process. View permits and standards at the the Mainegov DEP Bureau of Land and Water Quality site.